Lovely pond view! 2 bedroom 2 bath end unit villa ideally located in a gated community of Quail Forest in East Lake Woodlands. Open split floor plan with bonus wet bar area. Tile flooring and a newly painted interior. The eat in kitchen is spacious with lots of cabinets, newer stainless steel appliances and sliders that lead to the courtyard/front patio with attractive new tile flooring where you can practice your green thumb or use it as another option to enjoy outdoor living. Master suite offers a spacious bathroom with wall to wall closet space, dressing area with updated vanity. Second Master Bedroom features walk-in closet and private bath. 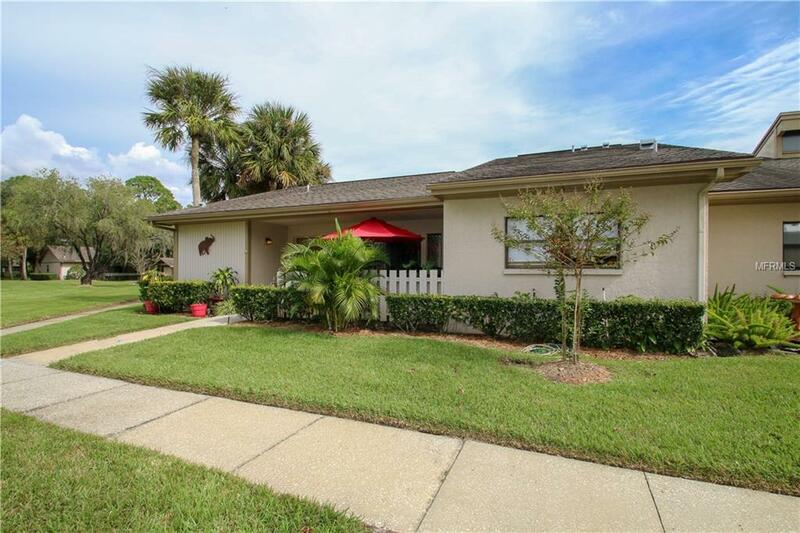 Both bedrooms and the living room have sliding glass doors that offer direct access to the large enclosed air conditioned Florida Room with attractive new linoleum flooring, large storage closet, overlooking a peaceful pond! Covered parking right outside your front door. New A/C (2016) with transferable maintenance plan. Community pool, plenty of nearby shopping and restaurants and just down the street from John Chestnut Park on beautiful Lake Tarpon. Additional Lease Restrictions Contact Management And Associates 813-433-2000. Peggy Semsey. Psemsey@Mgmt-Assoc.Com Additional Parcels Yn No Association Amenities CableGatedPool Association Approval Required Yn Yes Association Fee 313.00 Association Fee Frequency Monthly Association Fee Includes Cable TvCommunity PoolEscrow Reserves FundMaintenance ExteriorMaintenance GroundsPool MaintenanceSecurityTrash Association Fee Requirement Required Association Yn Yes Available For Lease Yn Yes Cdd Yn No Community Features Association Recreation - OwnedBuyer Approval RequiredDeed RestrictionsGated CommunityGolfPoolSidewalk Dpryn Yes Flood Zone Code X Floor Number 1 Garage Yn No Homestead Yn Yes Minimum Lease 3 Months Monthly Hoa Amount 313.00 New Construction Yn No Num Of Own Years Prior To Lse 1 Pet Restrictions Contact Management And Associates 813-433-2000. Peggy Semsey. Psemsey@Mgmt-Assoc.Com Pet Size Large (61-100 Lbs.) Pets Allowed Yes Property Description Corner UnitEnd Unit Property Sub Type Villa Senior Community Yn No Special Listing Conditions None Tax Annual Amount 2250 Tax Year 2017 Utilities Bb/Hs Internet AvailableCable AvailableCable ConnectedElectricity AvailableElectricity ConnectedPhone AvailablePublicWater Available Yrs Of Owner Prior To Leasing Re Yes Zoning Rpd-2.5_1.